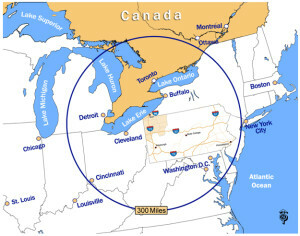 Located 300 miles from one third of America’s population and within a short driving distance of New York City, Chicago, Toronto, Philadelphia and Washington, DC, northwest Pennsylvania is centrally located and your gateway to major markets in the Eastern United States, the Midwest, and Canada. Northwest Pennsylvania the ideal location for your business expansion or location project. Locating in northwest Pennsylvania offers big city amenities while maintaining small town attributes of low costs and a high quality of life. Northwest Pennsylvania is a region rich in reputation for its industrial innovation and entrepreneurial culture. With a long history of industrial manufacturing, the region offers a quality workforce and flexible job training programs with access to pools of graduates from major research universities and technical institutes. Erie International Airport is served by four airlines with an average 19 daily scheduled nonstop flights to and from 5 major destinations. The Port of Erie and O-N Minerals Erie offer cargo shippers on the Great Lakes/Seaway System the finest facilities available. 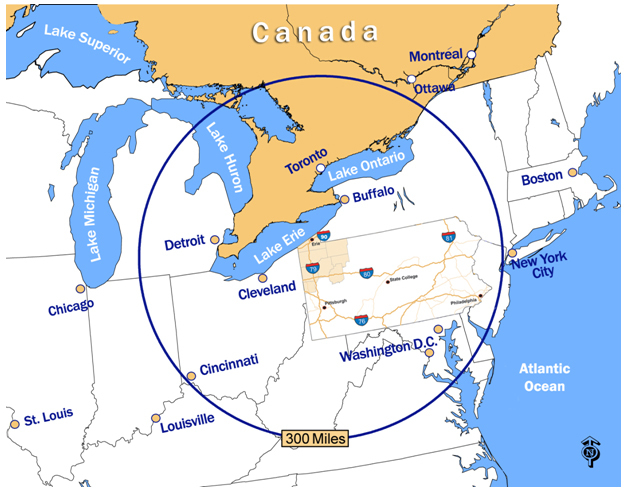 With 85 million people within a 500 mile radius, Port Erie and O-N Minerals are at the hub of the US and Canadian Industrial Center. Erie also boasts Donjon Shipbuilding & Repair. Tap into Erie: Freshwater is one of Erie, Pennsylvania’s greatest assets. Located on the shores of Lake Erie our community possesses an abundance of fresh water and fresh opportunities for new businesses and businesses interested in expanding or growing to a climate that’s right for growth. Abundant water, sewer, gas and electricity make it possible for us to support a wide variety of manufacturing, technology, distribution and agricultural businesses. Today many regions across the United States are beginning to face the fact that their freshwater supplies are limited. Water shortages are on the rise, from Charlotte to Atlanta and Los Angeles to Las Vegas. Now the second-largest producer of natural gas in the U.S., Pennsylvania shale gas is driving down energy costs and opening new opportunities for manufacturers. The recent surge in the availability of Natural Gas Liquids (NGLs) Marcellus Shale gas is drastically lowering the cost of plastics production by providing ethylene as an inexpensive feedstock alternative in addition to propylene. Over the past six years, the abundance of natural gas has lowered wholesale electricity prices over 40 percent. This has saved the average household nearly $ 1,000 a year with even greater savings for commercial and industrial customers. In addition, purchased natural gas cost rates have been lowered by more than 50 percent. A November 2012 report from TD Bank showed the entire manufacturing sector could save more than $ 50 billion per year in the form of these lowered costs. Pennsylvania went from importing 75 percent of its natural gas just six years ago to being a net exporter of natural gas for the first time in 100 years. There are a number of opportunities where business and industry can partner with the School of Engineering, these include sponsored research projects and customized training in everything from plastics processing to human resource and leadership. The Plastics Training Academy at Penn State Behrend offers workshops and seminars developed to meet the plastics industry’s twenty-first century skill building needs. Project, process, tooling, quality, and manufacturing engineers, technicians, and designers, as well as operators, team leaders, supervisors, management, human resource, set-up, maintenance, marketing, materials, and sales personnel will all benefit from our training. The Institute of Intelligence Studies at Mercyhurst University offers a bachelor of arts degree in intelligence studies, a master of science degree in applied intelligence, an online master of science degree in applied intelligence, and two graduate certificate programs that give students the education they need to pursue a career as an analyst in national security, law enforcement or business sectors. Erie Institute of Technology or EIT is an Erie Pennsylvania technical or trade school providing training programs for computer, electronics, manufacturing, technology careers. Training programs include Welding, RHVAC, Electrican, Graphic Design, CNC, Network and Database Administrator, and Biomedical Equipment Technology. The Department of Applied Technology was created to address high-priority workforce development needs in the region. Students will earn an Associate of Applied Science degree in administration technology or industrial technology from Venango College of Clarion University. Industrial Technology Programs include among others: CNC Operator, Electric Arc Welding, Natural Gas Technology, CADD, Welding & Fabrication, and Advanced Manufacturing. “Nine years ago Optical Filters expanded from the United Kingdom and opened its North American Manufacturing operations in Meadville, PA. We started business in a 6,000 sq. ft. facility and after 4 years added a 22,000 sq. ft. second building that will be expanded in 2014 to 32,000 sq. ft. The original building is now home to our R & D team. This team of young graduates from regional colleges has developed cutting edge technology that is providing the core technology for the next phase of Optical Filters growth. In Northwest Pennsylvania and Meadville we have access to key resources for our growth. A stable and educated work force, low costs for buildings and business taxes, in depth support services and a community that embraces manufacturing. “Ezeflow, a Canadian based company, purchased Flowline in May of 2010. Since that time we have invested over $5 Million to keep pace with the ever-changing industry we are in. The local and state government agencies have been very supportive of our initiatives. We receive work training support, international trade and marketing incentives and have been successful in securing low interest loans from the state. The area provides a stable workforce and western PA is an incubator for the metal working trades which we are a part of. The community supports manufacturing and is business friendly. © 2015 Copyright by N W Commission. All rights reserved.